A serious fire broke out on the 15,262 teu Maersk Honam in the Arabian Sea yesterday afternoon. The fire erupted in one of the cargo holds and appears to have spread across the giant boxship. 23 crew have been evacuated to the nearby vessel ALS Ceres and search and rescue operations are ongoing for four missing crewmembers with the Indian Coast Guard assisting. Two of the evacuated crew are understood to have sustained injuries. 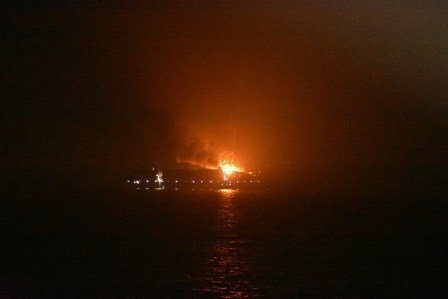 The ship – less than 12 months old – was en route from Singapore towards Suez when the fire started some 900 nautical miles southeast of the Omani port of Salalah. “The fire onboard the Maersk Honam continues and the situation of the vessel is very critical,” Maersk Line stated in a release. “We’ve received the news of Maersk Honam and the four missing crew members with the deepest regret and are now doing our outmost to continue the ongoing search and rescue operations. This by rerouting our own vessels, with assistance of vessels in the area – most notably ALS Ceres that thankfully acted promptly upon our distress call – and the local authorities,” said Søren Toft, chief operating officer at Maersk. The container vessels MSC Lauren, Edith Mærsk and Gerd Mærsk, all en route in the Arabian Sea, diverted their routes and are searching the area. The vessel is carrying 7,860 containers. The cause of the fire is currently unknown with Maersk Line stating it will investigate the matter thoroughly in cooperation with all relevant authorities.